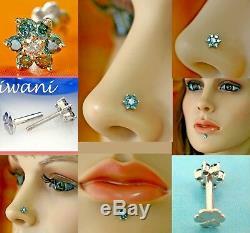 Be the proud owner of Indian Bridal Engagement Wedding Anniversary Gifts Body Piercing Jewellery / Jewelry Nose Pins Lip Labret Monroe, Rings, Studs, Screws, Tragus Earrings, Bones etc. We use only 100% Real Natural Genuine Earth Mined Diamond/s, Precious & Semi Precious Gemstone/s in our Jewellery studded in 14k Solid Gold. All our Item/s are 100% Brand New , Uniquely Hand crafted & Handmade. We try to provide minutest and accurate details about the products to the buyers in the item listings. No child labour is involved in manufacturing of any of our diamond/s & Jewellery. Certificate of Authenticity with the item/s? All Diwani Diamond Jewellery item/s comes with a Certificate of Authenticity mentioning every minutest details about the item/s. It is a tribute to Diwani Diamond Jewellery's commitments towards its prominent brand value quality, trust and transparency. With your instructions we can marked parcel as Gift but all responsibility is yours. Guyana, Jamaica, Panama, Trinidad and Tobago, Eritrea, Slovakia, Iraq. What is your piercings Post length & Post thickness Gauge? This Item post wire or post pipe height, length and thickness is universally comfortable standard size. We have to add more gold and labour in it. Can you make the Screw Post pipe thickness Gauge thinner than 18 Guage? Regarding straight screw back post pipe type fitting, we cannot able to make screw post pipe thinner than 18 gauge. It is very difficult to have thinner post pipe than 18 gauge. 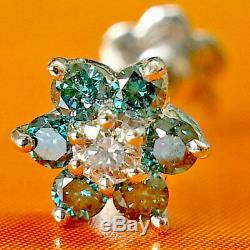 Can you make this item in White Gold? Just for your knowledge white gold is made from yellow gold mixing alloys in it. Both the Gold has to be finish with full or part White rhodium polish on it. All our item/s are made of 14k Solid Yellow Gold with full or part white rhodium polish on it. Sorry at present we do not have facility to manufacture items in White Gold. What is the different between 18 Gauge post thickness & 20 Gauge post thickness? Just for your knowledge, 18 gauge post wire or post pipe is thicker than 20 gauge post wire & 20 gauge post wire or post pipe is thinner than 18 gauge post wire. We try to make our post wire & post pipe as thin as possible so that it will pierce into anyone's nose / Lip / Tragus hole very easily and will not bother all the time while wearing. 16 or 17 Gauge'L' shape spiral band post wire is very thick and very hard to pierce in anyone's nose hole. We don't recommends 16 gauge thick'L' shape spiral band post wire. If you insist than at the most we can make 18 gauge thick'L' shape band post wire for you. 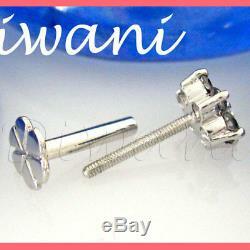 12, 14 or 16 Gauge Straight Screw back Post Pipe is very thick and very hard to pierce in anyone's nose / lip / tragus hole. We don't recommends you to go ahead with 12, 14 or 16 Gauge thick Screw Post Pipe. If you insist than at the most we can make it in 17 Gauge thick Screw Post Pipe for you without any additional charges. 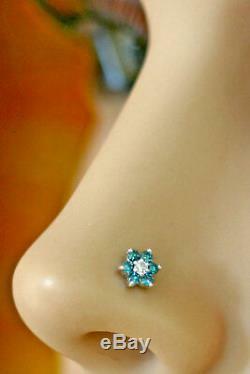 It will pierce easily in to anyone's nose / lip / tragus hole and will not bother you all the time while wearing. We offer a policy for you to return the ITEM, in case Item is " Significantly Not as Described". We stand behind every Item/s we sell. Due to any kind of. We strongly urge all customers to inspect their package for damage or tampering before signing the acknowledgement receipt of the courier company. All the images of the Item/s taken are of the MASTER piece and photographed under special studio lighting conditions, digitally zoomed enlarged and enhanced for your better viewing and it is not to the true scale. Actual Item/s colour and shine may slightly vary from the images shown here depending upon the various lighting sources that you are observe them in, as each piece is handcrafted and handmade. All weights of the Item/s are of MASTER piece and approx. Actual Item/s weight may slightly vary from the weights mention here in this listing, as each piece is handcrafted and handmade. Feedbacks from our esteemed customers like you. Please do not straight away file a case against us without contacting us. Wholesale or Custom made, make to order, tailor made Item/s inquiries. 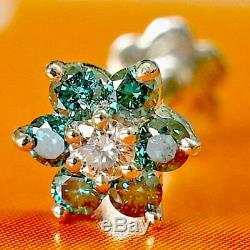 We welcome wholesale or specific item/s, designs, Sizes, carats, cut, colour, clarity, quantity, inquiries / orders from the buyers. If you want to make any custom made jewellery design/s, which at present is not there in ready stock with us then you can send us your design/s and ask for a quote. Sometimes it may take 3 to 4 weeks time to deliver for remote location. We offer a policy for you to return the ITEM, in case Item is SIGNIFICANTLY NOT AS DESCRIBED. We try to provide minute and accurate details about the product to the buyers. Metal weight of the product may slightly vary plus or minus 0.100 Grams (depending on different weighing scales). Carat total weight of stones in all products may slightly vary plus or minus 0.01 carats from stated weight. Dimension of the product may slightly vary plus or minus 0.5 mm from the stated mm size. For pendants chains are not included, Unless specified otherwise. 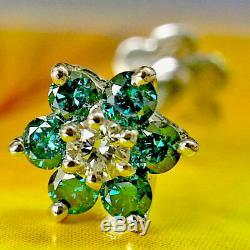 Every attempt is made to accurately depict the colors of the gemstones studded in the products offered on this site, However, because the colour you see of the gemstone is dependent on your computer monitor resolution, we cannot guarantee that the color you see will be accurate. The stated grade for color / purity in products that contains multiple diamonds will be the average grade of the multiple diamonds. These averages are calculated by adding all grades and determining the closest mean. All our items are examined by GIAs (Gemological Institute of America's) trained experts. Our decision of grading is final. Diamonds studded in some of the products are very small in sizes. 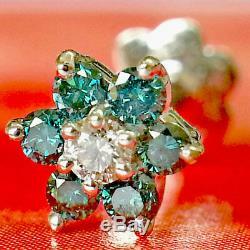 We recommend that you analyze the diamond size from the product details provided in the item specific. Thank you for your Trust. 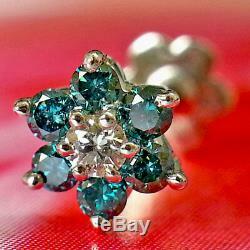 The item "Blue & White Natural 7 Diamonds Flower Nose Lip Labret Piercing Screw Ring Stud" is in sale since Tuesday, September 20, 2016. 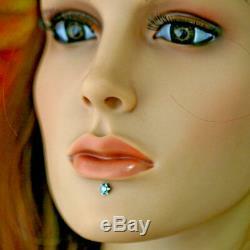 This item is in the category "Jewellery & Watches\Body Jewellery\Body Piercing Jewellery". 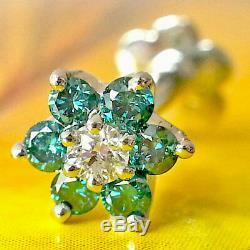 The seller is "diwanidiamondjewellery" and is located in Mumbai. 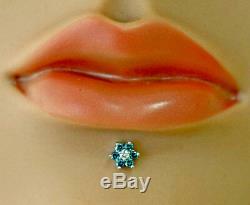 Diamond weight in Carat: 0.11 Ct Blue + 0.030 Ct White = 0.14 Cts.